[FTC Standard Disclosure] I received my Grilla Grill and extended rack from Grilla Grills for no charge as thanks for cooking on their Memphis In May BBQ team. These are the best beef back ribs I have ever tasted. 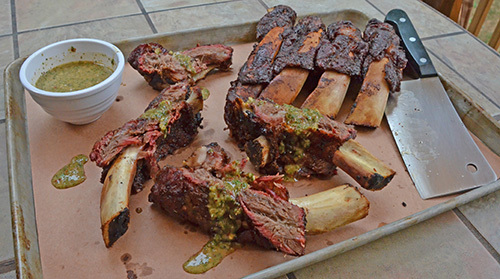 There are two types of beef ribs - back ribs and short ribs. Short ribs can be either "chuck" or "plate" but either way, they are very meaty and have a taste/texture similar to chuck roast. 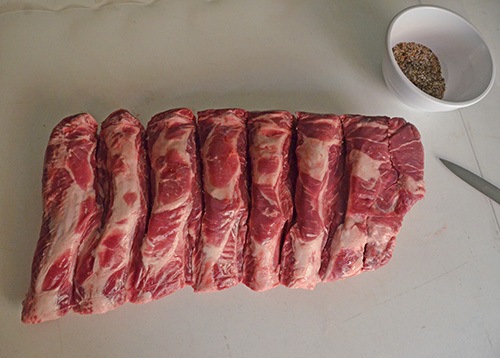 Beef back ribs come from the primal that gives us rib eye and prime rib. In face, beef back ribs are basically just the bones removed from a prime rib. Not as meaty - because it comes from that expensive cut, there usually isn't much meat left on back ribs. Steak on a stick - but because it is from that section, the meat is more like a steak than a roast. Argentina loves beef so I put a Argentinian spin on these beef back ribs. I made a simple seasoning that adds smoky chiles and a little bit of heat to a basic salt and pepper rub. Next I smoked these hot and fast, they are thin and don't have a lot of connective tissue so they don't need the low and slow treatment. Finally, I served them with a chimichurri sauce that was just over the top good. I should note that chimichurri sauce in South America is typically more thin and almost like a vinaigrette or Eastern Carolina BBQ sauce. Mine isn't authentic because I add a secret ingredient to it that makes it a bit thicker and I added cilantro instead of just flat leaf parsley. So it's "chimichurri-ish". 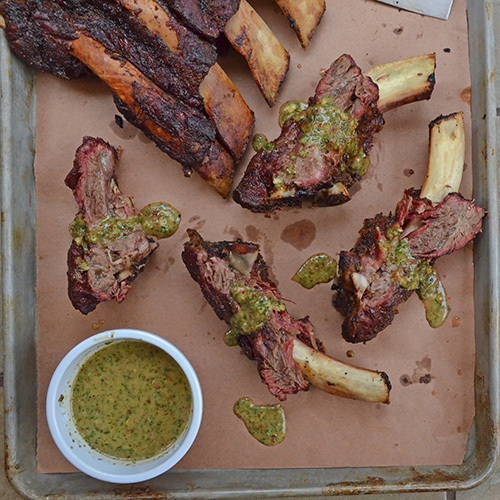 The ribs are very good with the seasoning alone but the chimichurri sauce takes them over the top. Plan on 2-3 ribs per person. Preheat grill for indirect heat at 325°f. Add smoking wood to the coals. I used our Grilla pellet grill loaded with their Competition Blend pellets. 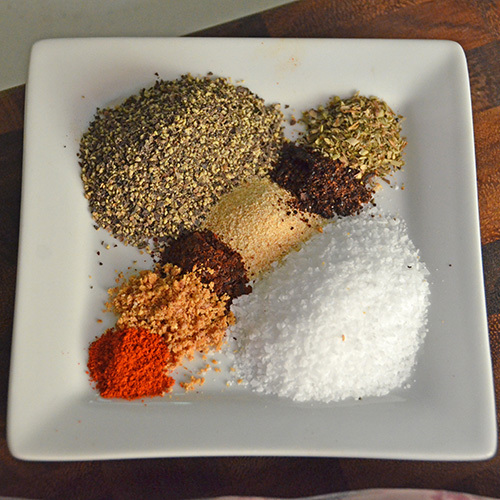 Mix the seasoning ingredients together in a small bowl. 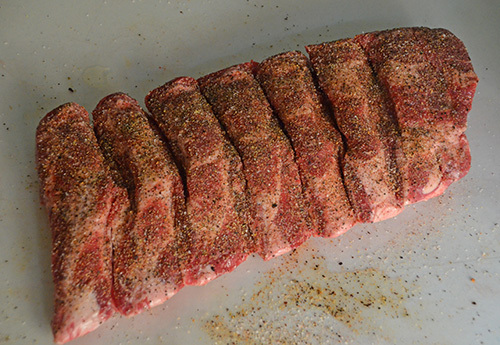 Prep the beef ribs. Remove the membrane from the back of the ribs. Lightly rub a little high temp cooking oil all over the ribs and then season the ribs all over with the seasoning mix. Smoke the beef ribs. 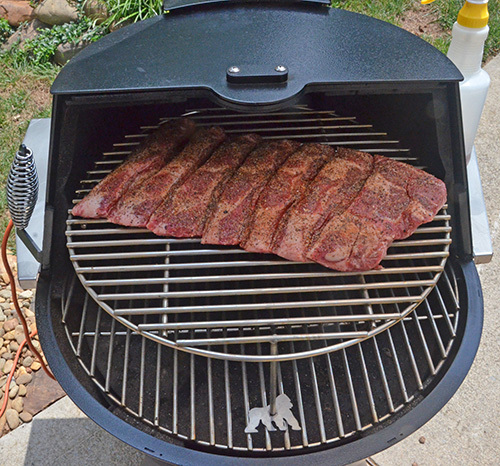 Once your fire is stable and your smoke is running cleanly, place the ribs, meat side up, on the grill. Spritz them with beef stock, close the lid and let them cook for 1 hour and 15 minutes. Braise the ribs. Place the butter, onion flake and red bell pepper (if using) in the middle of the sheet of foil. Place the ribs, meat side down, on top of the ingredients. Mix the soy sauce and stock together and then drizzle that over the back of the ribs. Fold the foil sides over the ribs and fold the ends over the ribs, forming a tight "envelope" or package. Return to the grill and let cook for another 1 hour and fifteen minutes. 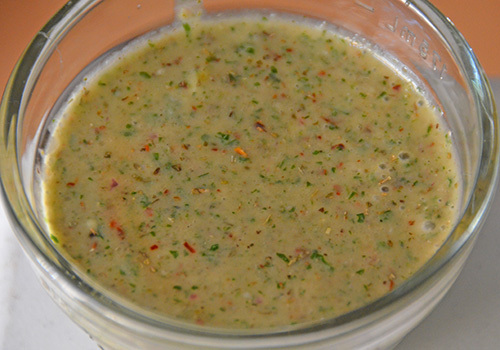 Make the chimichurri - Add all of the chimichurri ingredients to a small blender and blend until combined, about 10 seconds. Finish the ribs. The foil pack will be filled with hot steam so wear steam proof, heat resistant gloves and carefully open the package. 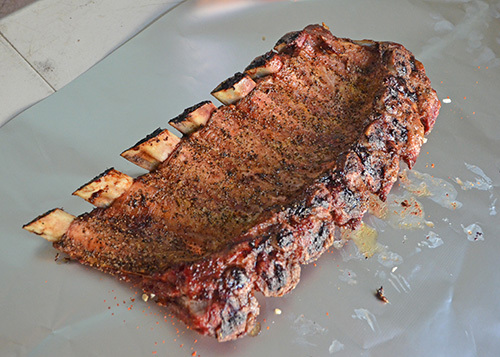 Return the ribs, meat side up, to the grill and let cook another 30 minutes. Reserve the juices. Serve the ribs. Drizzle the reserved juices on a cutting board. Place the ribs meat side down on the cutting board and slice between the bones. 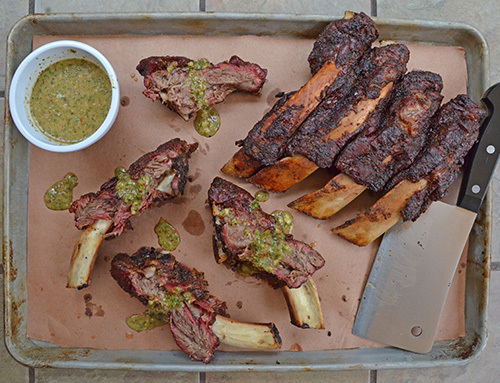 Serve each rib with some of the chimichurri drizzled over the ribs. Ancho or guajillo chiles - Look for these in the Latino section of your store. We usually buy them whole and grind them in a coffee bean grinder. You can buy ground ancho at most grocery stores these days. If you can't find either, substitute ground 3/4 teaspoons chipolte chile total for all of the ancho, guajillo, and cayenne chiles. Green pepper jelly - You can skip this altogether and have a more traditional, thinner chimichurri but the green pepper jelly acts as an emulsifier for a creamier sauce and adds even more flavor and heat. Beef back ribs LOOK meaty when you get them but as they cook, the meat will pull up around the bones and the bones will actually pop through in places. Don't worry, they'll still taste great. Here's how I remove the membrane for back ribs, both pork and beef. 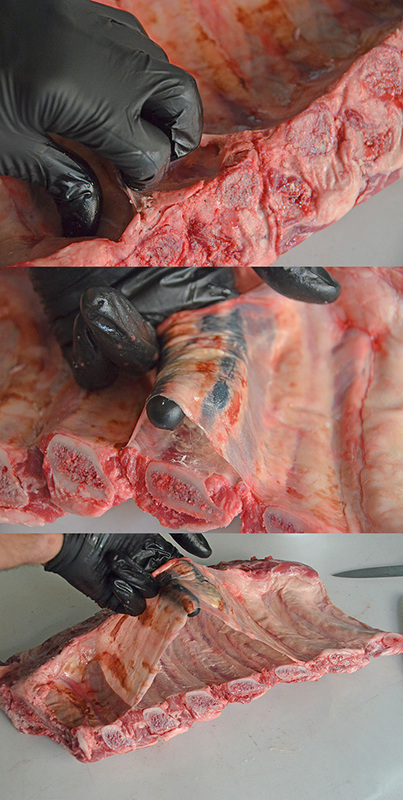 Use a butter knife at the back side of a bone to separate the membrane. Next work your fingers under the membrane, across the back of the rib. Once your are through, it is as simple as firmly lifting the membrane up and off. The seasoning was simple but delivered a lot of flavor. I used ground dried shallot instead of onion. The ancho and guajillo chiles are mild but add a smoky taste to the seasoning while the cayenne kicks up the heat. This is the "meat side" referred to in the recipe. This side should face up while smoking and down while wrapped in foil. 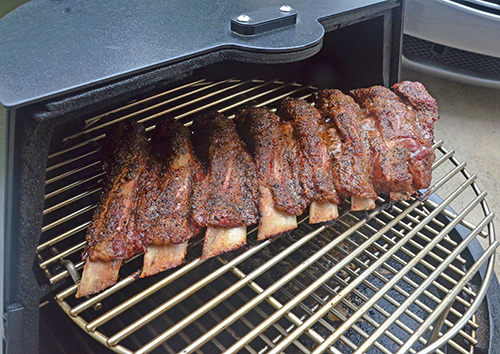 I smoked my ribs in my Grilla Grills "Grilla" pellet cooker and put the ribs up on the new extended rack. Even when I don't need the extra room, I like cooking on the upper level like this because I think you get better airflow around the meat. Good enough color for wrapping in foil to finish cooking. 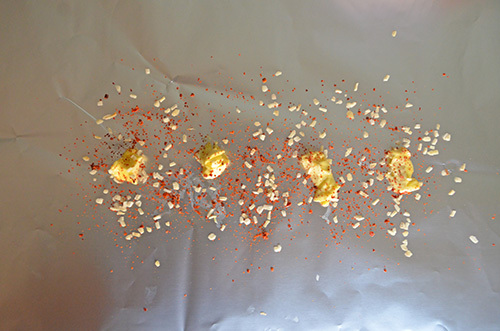 Butter, onion flakes, and dried red bell pepper down for the foil wrap. Notice how the back of the ribs are heavily seasoned too. That is the first part of this rib that will hit your taste buds so don't skimp on the backside. The chimichurri is loaded with herbs, spices, and chiles - tons of things going on when this crosses your palate. The Green Chile Jelly is my secret weapon. It binds the sauce together so it doesn't separate. 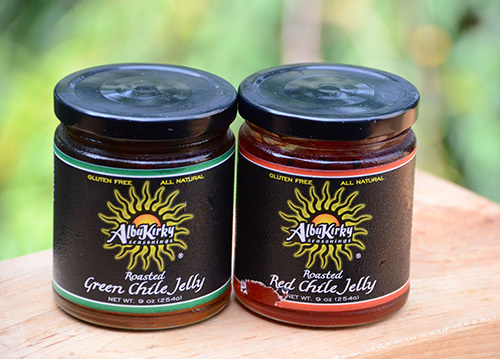 I use the Red Chile Jelly in my stir fry sauce recipe. When Albukirky's came out with these this year, Kirk sent me these two free samples to try out. Wow, are they great! I like everything Kirk makes but these two jellies, the Duke's City Sweet BBQ Sauce, and the Green Chile Rub are all favorites of mine. 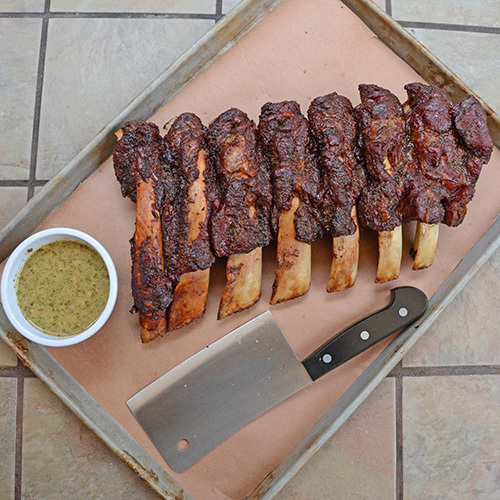 The sauce is powerful so don't drench the beef ribs with it. Just spoon a little over each one. These were so good that I stood there and ate all 4 of these slice ribs standing up at the counter.